Those wishing that the tense and occasionally nasty battle for Arizona’s open Senate seat would come to a close on Election Night appear out of luck. The nail-biter of a race might not be finalized for days, as the state’s most populous county — Maricopa, which includes Phoenix — has not announced a significant portion of its voting results. Maricopa County Recorder Adrian Fontes told ABC News there are still hundreds of thousands of votes that need to be tabulated, and that there’s a high likelihood that it could take at least a week to get the results. The race also could fall within 1 percentage point, in which case ABC News would not make a projection, due to uncertainties over whether all votes had been counted and whether tabulations were correct. That means that Democrat Kyrsten Sinema and Republican Martha McSally, two sitting congresswomen, will have to hold on a little longer before knowing who will make history and become the first female Senator from Arizona. People gather for the Arizona Democrats Election Night party at the Renaissance Hotel Downtown in Phoenix, Nov. 7, 2018. Both candidates’ respective parties wrapped without a conclusion, and neither candidate spoke. Sinema and McSally are battling to fill the seat being left open by outgoing Republican Sen. Jeff Flake. 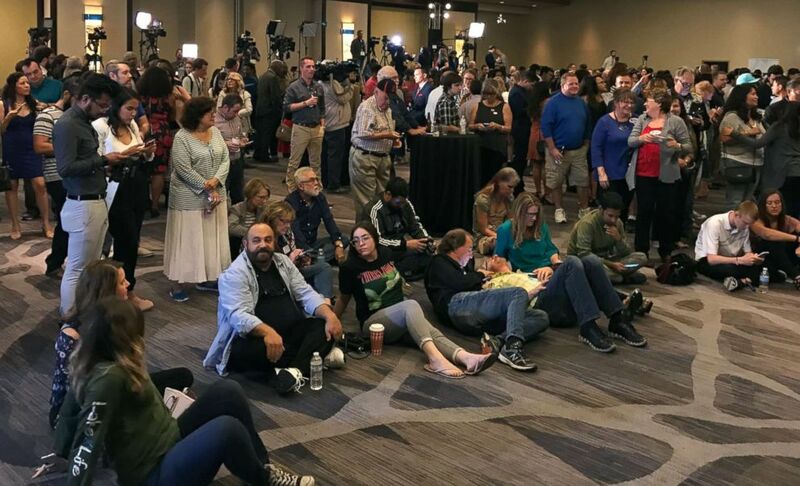 Sinema supporters who were among the final few at the watch party held by the Arizona Democratic Party were holding on to hope because of the Maricopa numbers. “I think she’s got a stronghold here versus other parts of the state, and I feel good that she can close the gap,” said Ted Hiserodt. Preliminary exit poll results suggest Sinema is getting help from moderate Arizonans, with a 27-point margin that has her up 63 percent to McSally’s 36 percent. “In recent history, we’ve had John McCain and Jeff Flake and Republicans who have a strong independent streak, and she’s a Democrat with a strong independent streak,” Winter told ABC News.